For a start, let us begin with a "network" that consists of two nodes. The nodes will do something simple: one of the nodes will create a packet, and the two nodes will keep passing the same packet back and forth. We'll call the nodes tic and toc. Later we'll gradually improve this model, introducing OMNeT++ features at each step. Here are the steps you take to implement your first simulation from scratch. Start the OMNeT++ IDE by typing omnetpp in your terminal. (We assume that you already have a working OMNeT++ installation. If not, please install the latest version, consulting the Installation Guide as needed.) Once in the IDE, choose New -> OMNeT++ Project from the menu. The project will hold all files that belong to our simulation. In our example, the project consists of a single directory. For larger simulations, the project's contents are usually sorted into src/ and simulations/ folders, and possibly subfolders underneath them. Using the IDE is entirely optional. Almost all functionality of OMNeT++ (except for some very graphics-intensive and interactive features like sequence chart browsing and result plotting) is available on the command line. Model source files can be edited with any text editor, and OMNeT++ provides command-line tools for special tasks such as makefile creation, message file to C++ translation, result file querying and data export, and so on. To proceed without the IDE, simply create a directory and create the following NED, C++ and ini files in it with your favorite text editor. OMNeT++ uses NED files to define components and to assemble them into larger units like networks. We start implementing our model by adding a NED file. To add the file to the project, right-click the project directory in the Project Explorer panel on the left, and choose New -> Network Description File (NED) from the menu. Enter tictoc1.ned when prompted for the file name. The first block in the file declares Txc1 as a simple module type. Simple modules are atomic on NED level. They are also active components, and their behavior is implemented in C++. The declaration also says that Txc1 has an input gate named in, and an output gate named out. The second block declares Tictoc1 as a network. 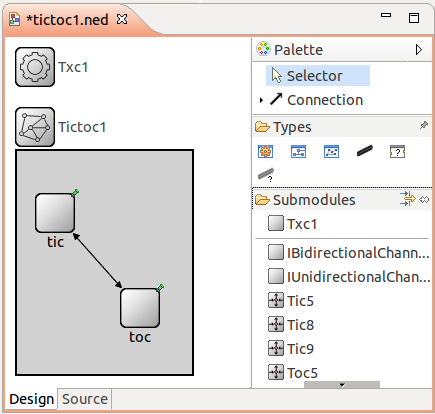 Tictoc1 is assembled from two submodules, tic and toc, both instances of the module type Txc1. tic's output gate is connected to toc's input gate, and vica versa. There will be a 100ms propagation delay both ways. The Txc1 simple module type is represented by the C++ class Txc1. The Txc1 class needs to subclass from OMNeT++'s cSimpleModule class, and needs to be registered in OMNeT++ with the Define_Module() macro. It is a common mistake to forget the Define_Module() line. If it is missing, you'll get an error message similar to this one: "Error: Class 'Txc1' not found -- perhapsits code was not linked in, or the class wasn't registered with Register_Class(), or inthe case of modules and channels, with Define_Module()/Define_Channel()". We redefine two methods from cSimpleModule: initialize() and handleMessage(). They are invoked from the simulation kernel: the first one only once, and the second one whenever a message arrives at the module. In initialize() we create a message object (cMessage), and send it out on gate out. Since this gate is connected to the other module's input gate, the simulation kernel will deliver this message to the other module in the argument to handleMessage() -- after a 100ms propagation delay assigned to the link in the NED file. The other module just sends it back (another 100ms delay), so it will result in a continuous ping-pong. Messages (packets, frames, jobs, etc) and events (timers, timeouts) are all represented by cMessage objects (or its subclasses) in OMNeT++. After you send or schedule them, they will be held by the simulation kernel in the "scheduled events" or "future events" list until their time comes and they are delivered to the modules via handleMessage(). To be able to run the simulation, we need to create an omnetpp.ini file. 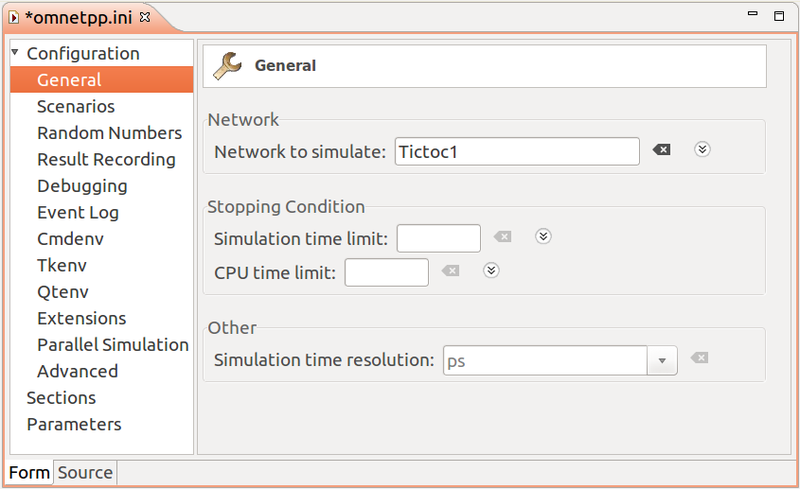 omnetpp.ini tells the simulation program which network you want to simulate (as NED files may contain several networks), you can pass parameters to the model, explicitly specify seeds for the random number generators, etc. Create an omnetpp.ini file using the File -> New -> Initialization file (INI) menu item. The new file will open in an Inifile Editor. As the NED Editor, the Inifile Editor also has two modes, Form and Source, which edit the same content. The former is more suitable for configuring the simulation kernel, and the latter for entering module parameters. tictoc2 and further steps will all share a common file. We are now done with creating the first model, and ready to compile and run it. Copyright © 2019 OpenSim Ltd.